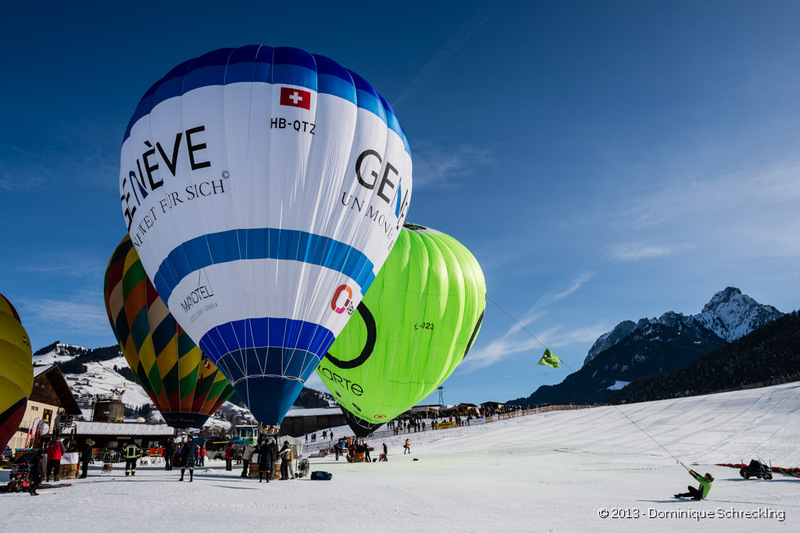 Since 1979 the small village of Château-d’Oex in a beautiful Swiss alpine valley of the Pays-d’Enhaut has been holding what has become today the largest balloon festival in the world, the International Hot-Air Balloon Festival. Each year, over 80 balloons are participating in the event and in the competitions that challenge the expert balloon pilots’ skills. 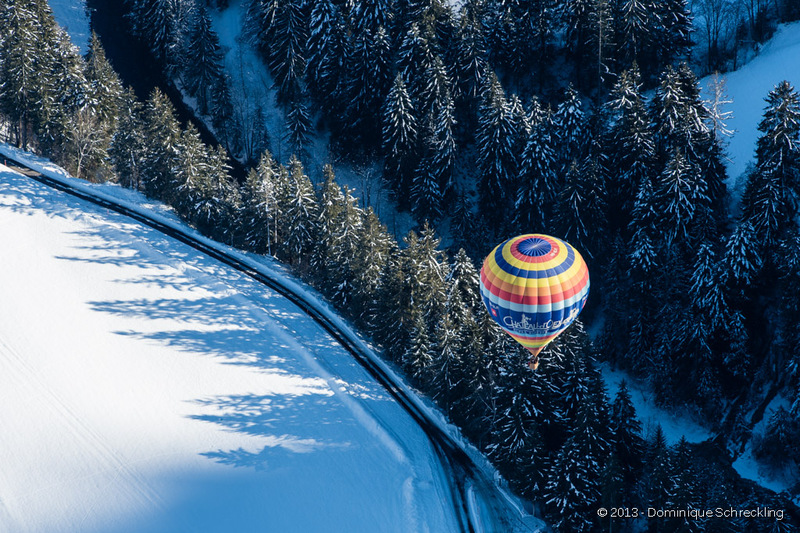 For the public there are the opportunities to take balloon rides as well as view and photograph some of the most spectacular scenery in the Swiss countryside. The 35th edition took place in the last week of January 2013. The opening day was a huge success thanks to exceptional weather conditions welcoming over 10’000 spectators and setting up a new record of 105 balloon rides on just a single day. Many guests of honor were present including Bertrand Piccard from Solar Impulse and Laura Chaplin, the granddaughter of Charlie Chaplin. Given the fabulous weather conditions and despite the -15°C (5°F) most of the pilots could not wait for the opening ceremony and offered the public and photographers a beautiful scene with bright colorful balloons in a deep blue sky just at the moment when the sun started to appear from behind the mountains. Ninety balloons from fifteen countries participated in this anniversary edition. As always, a balloon festival is highly dependent on the weather conditions. The organizers were satisfied with the edition allowing flights on five out of the nine days of the event. The main deception was the cancelled Night Glow since the preparations for this sound and light show could not be held due to heavy rains. In this 35th edition of the festival, I had the chance to attend two balloon rides which could hardly be more different. The first balloon ride, on board the balloon of the Geneva Tourism Office, was right on the opening day during the opening ceremony, that’s why I can’t present any photos of the ceremony itself. There was almost no wind at all. Being among the first to lift off, the pilots first had to find some winds to bring us out of the launch area to allow other balloons to lift off as well. There was no wind in higher altitude, so we went back down to a lower level to find the low winds inside the valley which finally pushed us in a northern direction along the valley. It was a calm, slow ride inside the valley in a wintery fairy tale landscape with fresh snow covering everything. Even when knowing the region, seeing it from a balloon gives a totally different perspective. The pilots demonstrated their skills when they mentioned a place in the village of Rougemont and said we are going to land on that spot. The pilots tried to find the right altitude with the mix of winds blowing along the valley and those coming down the mountains to get the balloons to go in the direction of that place. Minutes later, the balloon landed softly on the spot designated by the pilots. We lifted off again and continued inside the valley to Gstaad as the final destination of this 2-hours ride. 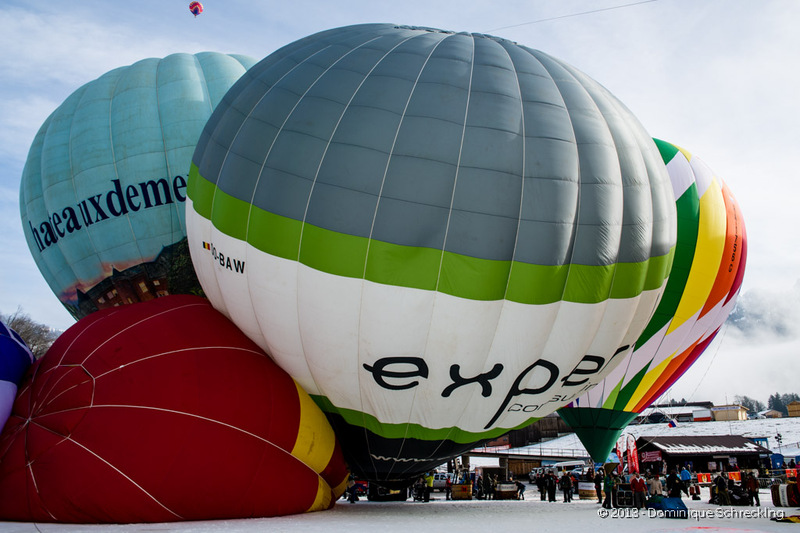 The second ride, on board the Belgian balloon of belair sponsored by Expertum, took place a few days later. The wintery fairy tale landscape suffered from the warmer temperatures. This time, there was no wind inside the valley, but strong winds in higher altitudes. We lifted off and went to an altitude of 3500m (11’500ft) above sea level. This time, we could not only see the valley itself from above, but also what comes behind the valley. Where else can one see the Mont-Blanc, the Jungfrau and the Matterhorn from one single place? Interested in experiencing this balloon festival yourself? See you in Château-d’Oex for the 36th edition from January 25th to February 2nd 2014.